North Korea’s nuclear push has painted the cousins down south into a dreadful corner, held captive to the brinkmanship of major powers and the whims of a maniacal dictator and his military cronies. With the few diplomatic avenues available in dealing with Pyongyang narrowing sharply, recently elected South Korean president Moon Jae-in has recently sent a special envoy to ASEAN. Though a clever move in and of itself, it was also just the latest in a line of early signals Seoul has sent to Southeast Asian capitals. To be sure, South Korea is just the latest – and is indeed a latecomer relatively speaking – in the long list of countries sending envoys to ASEAN. But the signals coming out of the Moon administration, though it is admittedly in its early stages, suggest that ASEAN is being raised to the same level as the four major powers operating in northeast Asia: the United States, China, Japan and Russia. The Moon administration might hope that this sort of signaling might increase the odds of ASEAN acting as a cohesive voice on North Korea, which as the potential to cause a calamity across the region if it makes good on arming ballistic missiles with nuclear warheads. As Russian President Vladimir Putin recently said, the North Koreans would rather eat grass than part with their nuclear weapons. He was right. Short of a war that would require a Western led military invasion, the evacuation of the south – a preposterous logistical challenge – and an immeasurable slaughter, the Chinese and Russian are also right when arguing the only answer is diplomacy. Writing for the Malaysian daily The Star recently, Kim Young-sun, secretary-general of the ASEAN-Korea Center – itself a symbol of ties between Seoul and Southeast Asian states – said the fate of South Korea and ASEAN were intertwined. Although the piece focused primarily on economic prosperity, Young-sun also correctly noted that without security there is no economic prosperity. “For peace in East Asia, ASEAN and South Korea need to work together on both traditional and non-traditional security issues. Peace and stability is also a prerequisite for sustainable economic cooperation, which is linked to regional prosperity and the well-being of our people,” he wrote. North Korea’s latest effort to flex its muscles is pushing the decades-long stand-off between Pyongyang and the Washington to a tipping point. U.S. President Donald Trump is in no position to kick the can down the road as his predecessors did, and his sometimes irrational attitude to foreign policy has muddied the diplomatic waters even further. 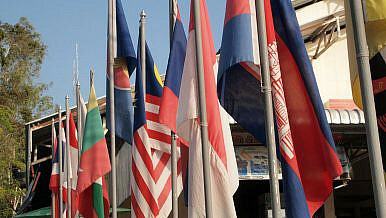 ASEAN does have much to lose, and the statistics are already well-known, be it in terms of the dire consequences for peace and prosperity should conflict break out or the overwhelming focus on Northeast Asia at the subregion’s expense that has already been made clear this year. Yet complications remain. Certain ASEAN countries have been gaining from their links to North Korea for years, and some of those links – including ideological and historical ones in some cases – are much harder to sever completely than others. And then there is the broader issue of the extent to which Southeast Asian states can actually bring themselves to take a tougher approach towards Pyongyang. When such hard questions have been asked of ASEAN before, such as on the South China Sea, its record has not exactly been encouraging. Yet if Southeast Asia and ASEAN want to be taken seriously as more than just a trading bloc or as an acceptable, polite, political veneer for governments and leaders who use dubious methods to cling onto power to hide behind, getting serious about security issues like North Korea is a necessity. By embracing South Korea, ASEAN could fill that very real need. What Is the Nature of Power in the Asia-Pacific and Who Wields It?Redundancy and Risk Management: Lessons from Japan’s Disasters for Southeast Asian InfrastructureLGBT Tourism and Inclusion in Southeast Asia: A Divided Future?Reflections on the 2018 Shangri-La Dialogue: What's the Indo-Pacific Anyway?What Does Indonesia’s Own Indo-Pacific Strategy Look Like?